For most of my adult life, I’ve been what can only be described as schedule adverse. Whether it was waking up at a regular time, eating meals consistently, or even planning a trip, my attitude towards schedules and routines had a tinge of childhood rebellion. I couldn’t let “the man” hold me down with his regimens! I needed to be free. There were times where I’d gaze with curiosity at the people who seemed to have it all together. The ones who you knew where they’d be every day, because their schedules were seemingly set in stone. A part of me wondered if they ever wasted time bingeing Netflix shows or if they were excited about each day when they already knew how it was going to pan out? But as my mind wandered towards adjusting my own schedule to be more orderly, I would quickly shake the idea off because the freedom from routines was oh so sweet. I quickly learned an incredibly valuable lesson about humility in how wrong I’d been. My whole life had been about bucking routines for freedom, only to realize that routines gave you real freedom. For the non-parents out there, I’ll keep the gushing over my little one to a minimum, but he really did change my life for the better by forcing my rebellious soul to connect with my pattern seeking brain. When my son was first born, it was an all out scramble. Learning how to parent was chaotic, stressful, and equally rewarding. Parenting is challenging for a couple reasons. One being that you are learning how to navigate your new life while responding to problems and scenarios you hadn’t imagined. The other is that babies don’t speak. Sure you get to know their cues, but no matter how much you ask them to go to sleep, they don’t understand you and you don’t understand them. In my sleep deprived state, I found myself missing things at home and work. There never seemed like enough time in the day to get things done and keep house and shop in order. In my despair, I turned to the one thing that always seemed to evade me, a routine. Starting a routine with an infant wasn’t easy. They are fickle little people. But I decided that even if I couldn’t get everyone into a routine yet, I could be of more use to my family if I was more organized with my time. I’ve always had a bit of an all-in mentality, so my first routine involved each day of the week broken down into fifteen minute intervals. It was a disaster. There was a constant feeling that I was supposed to be doing something and it actually made me more stressed out than I had been living in a more chaotic state. But I knew it was important to figure something out so I needed to look elsewhere for a new tactic. At the time, I was reading the biography of Benjamin Franklin by Walter Isaacson. 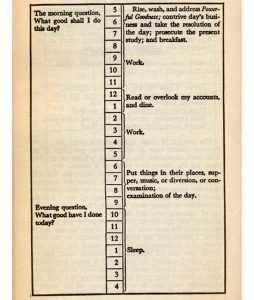 While learning about Mr. Franklin’s life, I came across his daily routine. What struck me was the simplicity of it. Instead of worrying about detailing every single minute of your day, you could just focus on time blocks dedicated to certain areas of life. 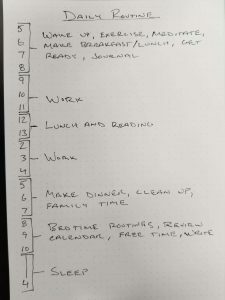 As a person who always thought of routines as being too constricting, this really appealed to me. The beauty in this routine format is the removal of guilt. Wake up a little later in your time block one day and don’t get a chance to journal? That’s okay, you’ll get it the tomorrow. And as someone with an infant, stopping to take a picture or enjoy a moment never felt like it derailed my whole day. Getting my routine down to these options was a matter of trial and error. Over time, I realized what things I thought I wanted to do, but never actually did. If a task continued to be skipped for more than a week, I removed it from the daily routine. Now, not only do I have a routine I can follow, I know my son is getting all the things he needs. Routines make it possible to get more done with your day. Instead of scrolling mindlessly through your phone, watching a few more shows than you originally planned, or . And if you are a person who has a hard time pulling away from work, routines can help force you into some much needed time off. When you’ve dedicated yourself to your routine, and ensured that time for family or hobbies are in there, taking time off to explore yourself and your interests doesn’t feel like a time waster, but a productive use of your time. Now that’s my son is a little older, he’s becoming more used to the routines and starting to follow them himself. We get to have meals together at the table, and implemented we follow a bedtime routine. We don’t always stick to it. Sometimes we are travelling, or visiting family and friends, but the routine waits, like a lighthouse, always ready to bring us back to a calmer, more organized life. I am thankful to my son for thousands of tiny little reasons and one of those happens to be the implementation of routines into my life. Where before I couldn’t find the time to do things because I unwittingly wasted more hours than I believed, I now have control over my time. And I was able to do it without giving up my freedom to enjoy life’s unexpected adventures.